New generation flat design indoor TV antenna with only 0.4 inch thickness. Two signal modes, short range (0-20 miles) and long range (20-100 miles), select the appropriate mode to find more channels. 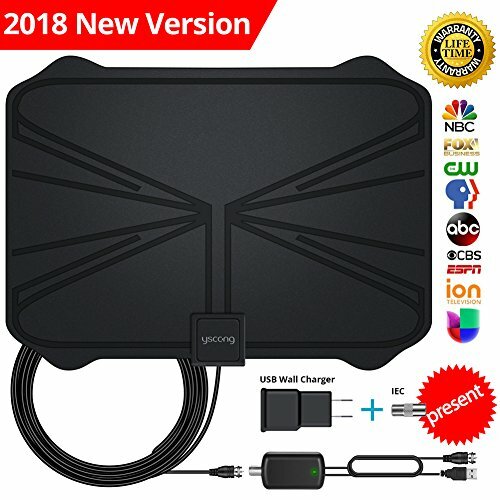 120 Day Back Money And Lifetime Warranty - Our TV Antenna is your best choice.If you experience any issues with reception or bad signaling feel free to contact us and get a refund (within 120 days after the purchase). We are pretty confident about the quality of our antenna that is why it comes with a lifetime warranty. If you have any questions about this product by YSCONG, contact us by completing and submitting the form below. If you are looking for a specif part number, please include it with your message.